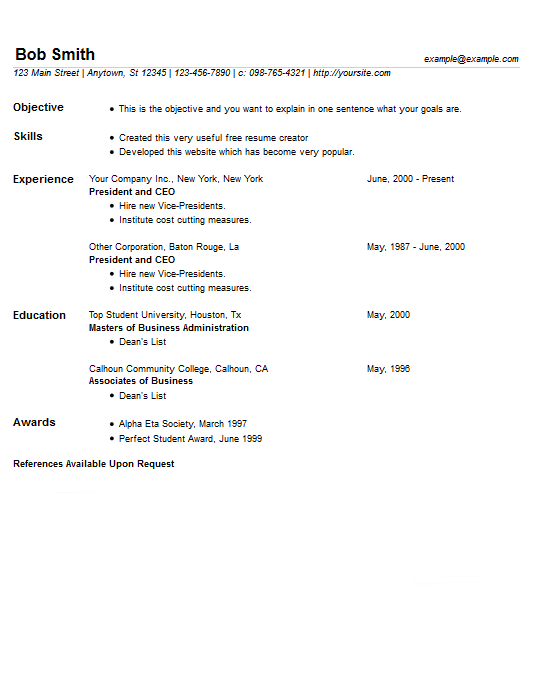 Here we present our most compact template, this style will do the best job of minimizing the page length of your resume. For more extreme cases of having "too many pages" the compacting nature of this design can reduce the number of pages in your finished resume. Using a compacting template like this to minimize your page length in combination with careful word choices can keep the number of pages to a minimum. Other tactics to use can be a more compact font and smaller font sizes. A large, bold name in the left top corner and a contact email in the right top corner eliminates any confusion about whom this is and how to get in contact to hire them. A isolation line draws the eye to the remaining personal data and creates a separate partition below that for all the important facts. The street address and telephone numbers are italicized. The information lines are single-spaced and the separations between the sections are double-spaced making for a more compact feel. Inside the sections the heading titles are on the left and bold face while the dates are on the right. The remaining text uses normal fonts all the same size. Take a look at Compact Resume Template 5 for another example of minimizing page length. Additional strategies can be found on our resume fine-tuning page. Visit this page to get this template: https://www.resume4free.com/free_resume_creator.htm.